I’d been wondering for some time about using the theory of special relativity as a Listener theme. As a mathematician, I had a good working knowledge of the theory and its implications, but I was concerned that general solvers might not be sufficiently aware of the ideas. However, after some discussions with some very non-scientific colleagues (and also my English graduate wife), I was finally convinced that Einstein, “something to do with going very fast” and in particular E=mc² were sufficiently well known. The Wikipedia entry for special relativity lists some of its consequences with links to separate entries on length contraction and time dilation, so I thought I could do something with removing L’s (contraction = becoming less) and adding T’s (dilation = spreading out). Once I finally found a few hours with not much else to do, I started by looking for words for which E=MCC would be a viable substitution. C²=CC at least had the benefit of being algebraically correct, and I hoped that solvers would accept that I had few options for implementing that part of the theme. Obviously the substitution could not be a direct one so some letter jumbling would be required. My search for words containing MCC which when replaced by E gave a jumble of a real word revealed 12 options. Albert Einstein was not an atheist, preferring as I understand it the term ‘agnostic’, and many scientists do hold religious beliefs. However, modern scientific thought has encouraged a trend towards atheism. Hence I was struck by the transformation of CATECHISM into ATHEISE, and the idea that special relativity and E=mc² had a part to play in atheising Christian teaching. So there was my title! My first thought with the T’s and L’s was that there were real words where T could be replaced by TT and LL by L. Unfortunately most of these ended up being the same word, albeit with an alternate spelling. 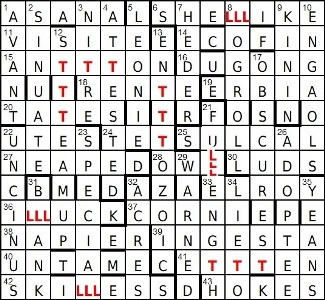 If I was going to do something with not-real words, then I’d need to be a bit more extreme, so I looked at T becoming TTT and LLL becoming L. Clearly there were lots of options for the former, and I managed to find 28 words with 3 consecutive L’s. Finally, I needed something to hint at the theme. Looking up Einstein in my venerable edition of ODQ gave the quotation “Raffiniert ist der Herrgott, aber boshaft ist er nicht” in German with the English translation “God is subtle but he is not malicious”. 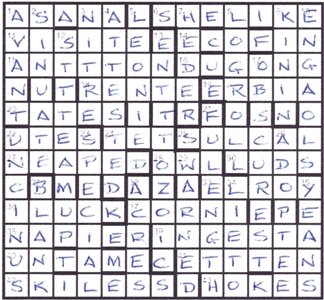 I thought this tied in perfectly with the theme and the religious connotation of the title, and with 45 letters in the quotation it would fit easily with reading off one letter from each clue of a normally sized grid. It was only after getting the vetters’ comments that I realised that more recent editions of ODQ only had the quotation in English, so I must apologise to those who struggled to find it. All of this had only taken me a couple of hours, so I was feeling pretty confident of putting it all together. My first idea was that the words SPECIAL and RELATIVITY would be unclued entries. However, after a few attempts, I thought that there would be too many unchecked letters, so I abandoned that idea, and went for a straightforward 45-entry grid with 4 each of the 3 thematic entry types. As it happened, I ended up with SPECIAL still in the grid, but I needed to clue it normally to complete the quotation. I thought it might provide a useful extra (albeit unannounced) hint at the theme. The clue writing is for me the laborious bit. My first decision was how to indicate the letters that I would need for the quotation, and as most regular solvers will know there are quite a few choices for this. Thinking back over previous Listeners, there had at that time been quite a few with misprints in the definition or with extra/missing letters in the wordplay; however, I couldn’t recall any of the ‘misprint anywhere in the clue’ type, so I went for that option. I appreciated that my choice could make solving the clues a bit more challenging than usual, but I certainly wasn’t deliberately trying to be obscure. Looking back on the clues now, I can see that they were a bit on the hard side. I tend write one or two clues at a time whenever I get a spare moment, and then keep coming back to the clues to see if they still read well and make sense. As a result the whole process took about 2 months. Once I was satisfied, I sent the whole package off to the Listener team in April 2017. Catechism was my second Listener submission, so I had some idea about what to expect from the vetting. When I got the vetters’ comments back on 22nd February, I was pleased to see that I’d graduated to a ‘good set’ of clues, although there were still quite a few suggestions for changes and improvements. Roger was concerned about underchecking on two 5-letter words, but had very helpfully suggested possible alterations to the grid to turn them into 6-letter words – wonderful! With a suggested publication date in April, there was then a flurry of clue-writing and rewriting activity to get everything ready for the publishing deadline of 1st March. A big thank you to Roger and Shane for all their hard work. I must also thank all those who submitted comments with their solution. It is very gratifying that most, although not all, of you seemed to have enjoyed Catechism. A few people didn’t seem to have quite understood the time dilation part of the theme, although it seems like most got the E=MCC bit. The ‘Shape of ovals…’ clue, 29dn, seemed to be one of your favourites; sadly I cannot claim ownership as it was one of Roger’s suggested amendments that I also particularly liked. tnap’s first Listener concerned the delights of the Greek-English Lexicon as fought over by Liddell and Scott. This week, we had misprints in the clues and eight answers that needed thematic adjustment before entry, and 4 needing to be jumbled. Misprints anywhere in clues can be tough to decipher, and so it transpired. Luckily, CANTICUMS at 2dn came fairly early in the solve. I say “luckily”, but really all that did was confuse me since we had a 9-letter answer going into a 7-letter entry. What’s more, 27ac NEAPED gave 2dn ending in an E and I think it’s fairly obvious that CANTICUMS doesn’t have an E anywhere. When 26dn showed itself as ACCOMPTED going into a 7-letter space, something quite devious seemed to be going on. Suffice it to say, I had no idea what was going on for an awfully long time. Moreover the correct letters of the misprints seemed to be spelling out a load of gobbledygook! All in all, this was a tough solve, made even tougher by not having been a fan of The Jetsons and consequently having no idea that the junior Jetson brat was Elroy. Oh well. Eventually, and don’t ask me why, I wondered if the ‘comment’ spelt out by the corrected misprints was German. I googled ‘raff…n…ert and was rewarded immediately with a reference to Einstein. I leafed through my recently acquired Oxford Dictionary of Scientific Quotations (courtesy of Polo by Apt last year) and all was revealed. Raffiniert ist der Herrgott, aber boshaft ist er nicht for “Subtle is the Lord, but malicious He is not. Given it was from Albert, it didn’t take long to work out the relevance of e=mc2 and substitute E for MCC and then anagram the result to give four of the entries. The last bit, shrinking LLL in four entries to a single L and dilating a T in four others to TTT took a bit more time, especially ANTTTON. At first, I thought the title was just some sort of description of the quotation, but I knew there would be more to it than that. Substituting an E for the MC & C and then unjumbling, gave ATHEISE, which I assumed was a reference to Einstein’s supposed theological stance. All in all, a pretty tough puzzle from tnap. I think I got there in the end, thanks. First of all I’d like to thank tnap for an excellently-themed puzzle. I have to say I was baffled for a long time with this one. I had about three-quarters of the grid filled; I could see that the ‘former giant’ at 41ac had to be ETEN from the wordplay, that 12d was STEAM UP, & that 6ac’s SHELL-LIKE had two too many letters for the grid but could not get what I had to do at all! When I finally solved ANTON at 15ac [I am assuming this is parsed as (w)ANTON ?] and the checkers suggested it might be ANTTTON then I did think of Lorenz transformations and time dilation. Length contraction soon followed. As my German doesn’t stretch much beyond “Noch ein bier, bitte”, I had no knowledge of the hidden phrase in German but there were enough ISTs and DERs appearing for it likely to be that language. Eventually, in near-desperation(! ), I resorted to a German wordsearch-solver to look up R.F..N..RT and RAFFINIERT appeared; it was then only a short hop to finding the whole phrase, attributed to Einstein. Phew! Some of the clues were tough work (but fair), given there was no hint as to where the misprint was to be found. I loved the two PDMs, especially the MC2 being replaced by E! And the Title: is this ATHEISE once the above transformation is applied? I think so! Typing that title in, I have just realized that it, too, must probably be jumbled ‘after replacing some letters according to a thematic equivalence’. I took MCC out of it and added an E and jumbled it and the puzzle becomes ATHEISE. I am not sure about that. Einstein would probably have considered that his ‘Raffiniert ist der Herr Gott aber boshat ist er nicht is more of a catechism than an attempt to atheise us. I am leaping ahead. We muttered about ‘thematic effects’ and ‘misprints’ before muttering even more atheistically about ‘jumbles’. But I did check tnap’s alcohol content. He wasn’t drinking out of one of those lovely presentation beer mugs at the Paris Listener Setters’ Dinner three weeks ago: however, his clues did still justify his membership of the topers’ outfit. There was just a ‘punch’ in the across clues, ‘Twisted knee, not good, receiving a punch that roughens savate (6)’ Oh dear, tnap must have been struggling to find a G misprint if he had to resort to such an obvious ‘savate’. We worked out that this was GENU less the G(ood) round Mat (a punch that roughens) all reversed. Actually the very first clue we solved was ‘Previously in French vintage – mulled without skin of grape (5)’ Now he’s talking real wine – or maybe not. We back solved from AVANT*, removed the G(rap)E from vintage and found that we had an A misprint and the word was ‘vantage’. Ah well, there was a ‘Nip’ in 9d, ‘Nip after catty – it helps preserve the flowers (5)’ There’s a rather quaint picture in the surface reading. tnap must be chasing puss who is determined to wreck his garden: we struggled to work out that the ‘Nip’ was giving us ‘Hip’ (IN) and that the catty was a KIN, giving us KININ. Cheers, anyway. tnap. Maybe we can share the punch, mulled wine and nip next year in York! These clues were challenging and we were a couple of hours into our solve before I (who should have spotted it sooner – I have German-speaking grandchildren and use the language regularly, though I admit that even the five-year-old speaks the language more accurately than I do) realized that the IST DER HERR GOTT of the comment had to be German. We had already seen that SHE’LL LIKE, SKILL-LESS, FULL-LENGTH and ILL LUCK were being entered with one L acting for the three. Sadly we were looking for more of the same and it was a while before Einstein prompted us that this was his space-time continuum. Time was going to be expanded TTT, while space L(ength) was contracted. My nuclear physicist Numpty husband claims that this was a very primitive interpretation of the theory but sobeit. We had an almost full grid and only ERBIA, SINUATE and some version of ADOPTEE/ADOPTED and HO?ES or HO?DS would complete it with those four being the clues whose wordplay we hadn’t parsed. We knew we had to somehow incorporate E = MCC into our calculations and worked backwards, anagramming those words with an MCC in the place of an E to see whether we could approximate the solution with the wordplay – and, of course we did. CAMBRIC gave us the fine material that converted to ERBIA; CANTICUMS were the songs that became SINUATE, ACCOMPTED changed to ADOPTEE and last of all, SCHMOCK (after SCH(ool) Taunt or MOCK) gave us HOKES. That last one was tough – well, the whole solve was no doddle. Thanks tnap for the challenge. COLOUR A-TO-H GULES (red) I-TO-P OR (gold or yellow) REST VERT (green). This was clearly an anagram: (anagrind= HURT) SOVIET OR SAGE COLOUR PLOTTER. And, for those doubting me, of course you’ll all have spotted the blatant clue to which flag it was on Row 4, 11th cell: “21 s”, the old guinea in the UK being 21 shillings. Now you can’t tell me that that’s coincidence, surely? Here is my solution attempt. Joking apart, a beautiful puzzle – thanks MynoT!